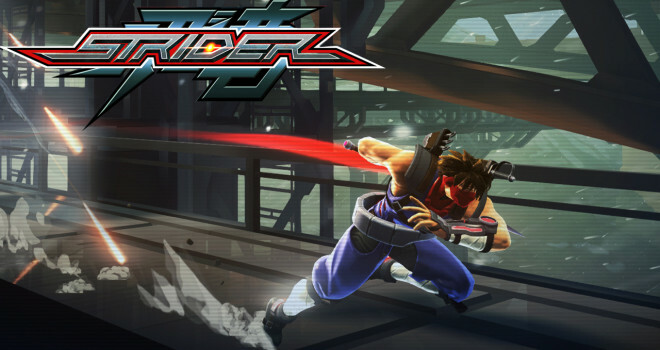 Strider Gameplay Video Shows Off What The Game Can Do. Capcom-Unity recently hosted a livestream of Strider HD- a game that is being co-developed with Double Helix that made the recent Killer Instinct game on Xbox One. The video recording below shows a weapons research area from the game and ends with a battle against the Mecha Pon boss all of which are featured in the livestream. Capcom has estimated that Strider HD will take 7-8 hours for players to finish the game, assuming you aren’t screwing around with sub-quests. The game is set to be a part of the coveted legendary “Metroidvania” genre in which its set in one large, interconnected map and you can go to areas with new weapons and abilities you couldn’t reach before. For the benefit of those who haven’t read my other Strider posts or for those who have just now sparked an interest in this game, Strider HD will be released on February 22, 2014. It’s a downloadable title only meaning it’s coming to Xbox Live through both Xbox One and 360, PC through Steam, and PlayStation Network through both PlayStations 3 and 4. As a bonus, if you get the PS3 version, you’ll be given a code to download the PsOne versions of Strider 1 & 2 and a theme as bonus content. At the risk of sounding like a broken record, for the last time, there is no Wii U version, so don’t ask about it.